Let me start this blog post by saying I am seriously blessed in the in-law department. And, I'm not just saying that because they are the other two people, besides my mom, reading this blog. BLESSED. I genuinely get excited to visit them, and try to lure them to come visit us any chance I can. Trapped on a desert island, you only get to pick 10 people, they're coming on my island. It was really too early to tell anyone we were pregnant , but we were booked for the next several weekends, and I wasn't sure when we would both get a chance to see Austin's parents in person again. So, we decided to go ahead and let them in on our little secret early. So, Pinterest was little help. Everything I see on there feels overdone by this point. We figured we would come up with something that relates to Austin's parents' hobbies/interests/routine. Sooo, that left us with wine, their yellow lab, Starbucks, traveling to Europe, or sitting on the dock. Little dock chair---for future baby. Well, they're getting ready to sell the house and move closer to the city, so that plan was no good. Didn't want any more sentimental attachment than there already is keeping them from making that leap. Bandana on family dog, O'Malley. We figured we would write something like 'future Aunt' or 'Aunt in training' but didn't know if they would see the writing or if it would make sense. Starbucks coffee cup. Sneak out of the house and have the barrista pass the cup to them through the drive thru along with their morning order. 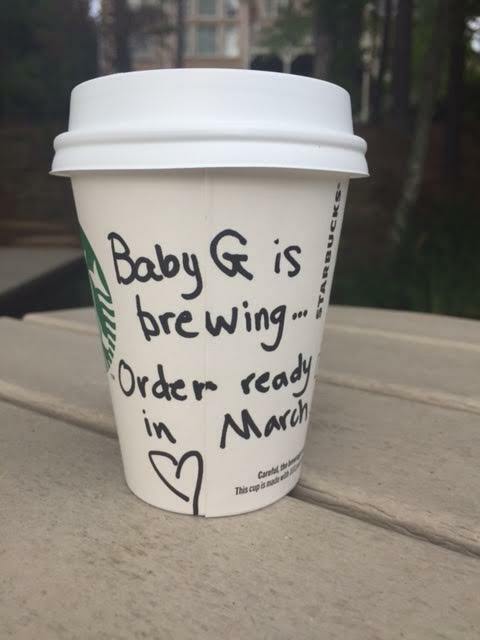 It would say 'Baby G is brewing. Order ready March 2017.' Brillaint! Right? We decided to bring it home, set the cup on the kitchen counter. They both walk in at the same time---and Voila! Excited grandparents. Alas, nothing is ever that easy at the Grieb house. They are renovating their bathrooms, so who rolled down the driveway? Not John and Heide. Four workers who invaded the house with tile products. We figured questions about grout color might kill the 'you're a new grandparent' mood. So, we took the cup out to the dock, surely their next stop of the morning. These people are like clock work on Saturday mornings (except when you're waiting anxiously to tell them they're grandparents.) I think we sat on the dock with that coffee cup for an hour, which feels like three when you're that antsy. she moves the chair closer to us and misses it completely. Eventually Austin asks her to look over there. She's confused, thinks it may be our coffee or John's coffee, THEN....finally reads it and freaks. He comes out, chairs are moved, Mrs. Heide's entire cup of coffee is somehow spilled, water is poured on the dock with a coffee cup to clean off coffee. Everyone just tries to get Mr. John to sit down. EVENTUALLY, he too notices. Light bulb---and happiness. But I think the best part of this story is how appropriate it is. Nothing ever goes as planned in this family---this big crazy Grieb family. I hope our little baby G is blessed with Mrs. Heide's enthusiasm, big heart, optimism, and good naturedness no matter what life throws her way. And Mr. John's brains, athleticism, wit, and loyalty. But, no matter what genes they inherit---one thing is for sure, not a single day of their life as a Grieb will be boring or predictable, and they will be loved fiercely every single day.